With more than two-third's of our student body living on campus, Carroll's residence halls and apartments are designed to accommodate the living needs of today's college student - both on a personal and academic level - providing a wide variety of services close to home. Each hall has a dedicated computer lab with academic software where students can work on class projects without leaving home, and chapels are located in each hall, offering Mass, Campus Ministry events and a quiet place to reflect, meditate and pray. The majority of the rooms in Guadalupe and St. Charles are double rooms. Basic amenities in each room include network ports, wi-fi, cable hook-ups, closets, X-long twin beds, dressers, desks and chairs, and shared restroom and shower facilities are available in each floor. Each hall is staffed by an Assistant Director, Community Advisors, and Peer Ministers. There are more advantages to living on campus at Carroll than not having to shovel snow or deal with a morning commute. 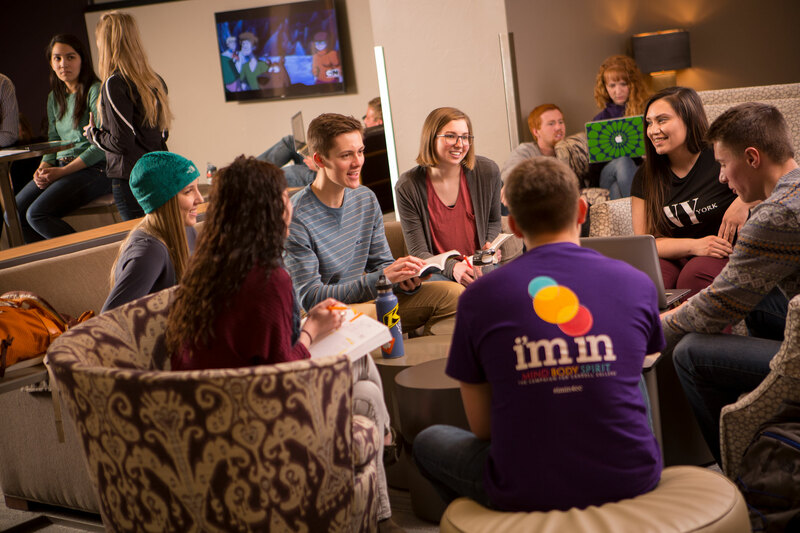 Life in any of our residence halls is where you’ll experience the kind of moments that shape who you become, foster lifelong friendships, and broaden your perspective on the world. Each of our residence facilities has a unique energy and feel. No matter where you live on campus, your home—and the friends who share it with you—will be a distinct source of pride during your time here. New for 2018-2019: Laundry will now be included for all on-campus living options. No more quarters necessary! Known as “Guad,” this is where most first-year students at Carroll live, benefiting from a shared transition to life here. With around 350 students, Guad offers separate floors for male and female students, abundant activities, spacious common areas, a computer lab, kitchen, laundry facilities throughout, and close proximity to the famous Guad Hill Slip-N-Slide. St. Charles Hall—referred to as “Charlies”—is the first building ever constructed on the Carroll campus and is home to 230 students. With single-, double-, triple-, and quad-occupancy rooms available, Charlies easily boasts as much architectural character and historical intrigue as any building on campus. New for 2018-2019: Third years and above can secure Deluxe Single rooms at the Double rate, and choose from any of our 5 meal plans. Charlies will also house our new 12-month housing option for student at all levels. Borromeo Hall was originally built for students entering the priesthood, and has maintained its reputation as the residence hall for students who want a more quiet and peaceful setting. Known as “Borro,” it offers close proximity to classrooms, labs, and the dining hall. Built in 2003, Trinity Hall offers 51 four-person suites, with eight distinct layouts available. Each suite comes with living room furniture, as well as a fully equipped kitchen, a bathroom with separate vanities, and furnished bedrooms with a loft kit. Available to third-, fourth-, and fifth-year students, the Campus Apartments offer beautiful living accommodations with a more independent feel than our traditional residence halls. Each building has 18 unfurnished apartments, including 12 three-bedroom units and six two-bedroom units, all of which feature private bedrooms, a living room, kitchen, and bathroom. For more information about housing or meal plans, you can contact the Student Life Office at 406.447.5457 or email Student Life at studentlife@carroll.edu.